Objective: To investigate the presence of autoantibody deposition against type 2 tissue transglutaminase (TG2; a reliable marker of the whole spectrum of gluten sensitivity) in the jejunal tissue and brain of patients with gluten ataxia and in control subjects. Methods: The authors evaluated jejunal biopsy samples from nine patients with gluten ataxia and seven patients with other causes of ataxia for the presence of TG2-related immunoglobulin deposits using double-color immunofluorescence. Autopsy brain tissue from one patient with gluten ataxia and one neurologically intact brain were also studied. Results: IgA deposition on jejunal TG2 was found in the jejunal tissue of all patients with gluten ataxia and in none of the controls. The intestinal IgA deposition pattern was similar to that seen in patients with overt and latent celiac disease and in those with dermatitis herpetiformis. Widespread IgA deposition around vessels was found in the brain of the patient with gluten ataxia but not the control brain. The deposition was most pronounced in the cerebellum, pons, and medulla. Conclusions: Anti–tissue transglutaminase IgA antibodies are present in the gut and brain of patients with gluten ataxia with or without an enteropathy in a similar fashion to patients with celiac disease, latent celiac disease, and dermatitis herpetiformis but not in ataxia control subjects. This finding strengthens the contention that gluten ataxia is immune mediated and belongs to the same spectrum of gluten sensitivity as celiac disease and dermatitis herpetiformis. Gluten ataxia is defined as sporadic cerebellar ataxia associated with the presence circulating antigliadin antibodies and in the absence of an alternative etiology for ataxia. The pathophysiology of this disease is immunologic. Evidence for this includes the reactivity between antigliadin antibodies and cerebellar Purkinje cells, the presence of oligoclonal bands in up to 50% of patients with gluten ataxia, the inflammatory pathology in cerebellar tissue, and the higher prevalence of additional autoimmune diseases seen in patients with gluten ataxia.1–3 Furthermore, clinical improvement has been reported with IV immunoglobulins in isolated case reports and small series.4,5 A systematic study has demonstrated improvement of the ataxia associated with adherence to a strict gluten-free diet, even in those patients with gluten ataxia without enteropathy.6 Only 30% of patients with gluten ataxia have evidence of an enteropathy in keeping with celiac disease.7 Patients with gluten ataxia and enteropathy are clinically indistinguishable from those without enteropathy. In this way, gluten ataxia is analogous to dermatitis herpetiformis, another disease of the gluten sensitivity spectrum. In dermatitis herpetiformis, the brand of the disease is born by the skin, with some cases having no enteropathy on routine histologic examination. Type 2 tissue transglutaminase (TG2) has been identified as the autoantigen recognized by antiendomysium antibodies, the most specific marker for celiac disease.8 Antibodies against TG2 are now accepted as a reliable marker for celiac disease. We have recently demonstrated evidence of antibodies targeting TG2 in the small bowel mucosa of patients with celiac disease and patients with dermatitis herpetiformis.9 In addition, we have demonstrated that such antibodies are deposited in what appears to be histologically normal small bowel mucosa even before they can be detected in the circulation and prior to the formation of the gluten-induced flat small bowel lesions. These autoantibodies have also been found in extraintestinal tissue (e.g., liver, muscle, lymph nodes) of patients with celiac disease, thus strengthening the contention that gluten sensitivity is a systemic disease with diverse organ involvement.9 To prove that gluten ataxia belongs to the same spectrum of gluten sensitivity as celiac disease and dermatitis herpetiformis, we investigated the presence of in vivo bound TG2-specific IgA in the gut and brain of such patients. Patient selection and tissue samples. Patients were recruited from the gluten sensitivity/neurology clinic of the Royal Hallamshire Hospital, Sheffield, UK. Duodenal biopsies were taken from nine consecutive patients diagnosed with gluten ataxia (sporadic ataxia with circulating antigliadin antibodies in the absence of any other cause of ataxia). The biopsies were done as part of clinical investigation in the light of positive serology suggestive of gluten sensitivity. Four biopsies per patient were taken from the distal duodenum using biopsy forceps, through a conventional forward viewing endoscope (Key-Med, Southend, UK). The presence of celiac disease was established by histologic examination looking for evidence of crypt hyperplasia, villous atrophy, and increase in the intraepithelial lymphocytes. Duodenal biopsies from seven patients with ataxia due to other causes who also had positive antigliadin antibodies (control group) were examined as well. These patients were selected from a larger number of patients with genetic or other causes of ataxia attending an ataxia clinic. Their selection was based on the presence of positive serology suggestive of gluten sensitivity and thus requiring duodenal biopsy. The prevalence of antigliadin antibodies in patients with genetic ataxias was not significantly different from that of healthy controls. Additional control jejunal biopsy samples included 10 patients with celiac disease and no neurologic symptoms and 10 healthy adults who underwent endoscopy for unrelated complains (negative serology for gluten sensitivity). 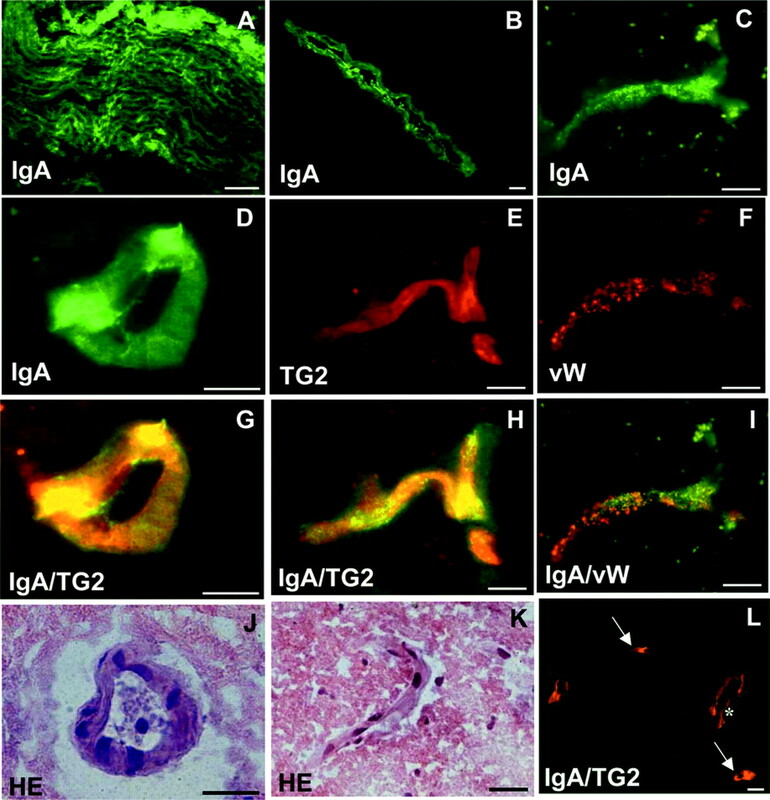 The biopsies from both the gluten ataxia and the control groups were examined (blinded) for the presence of in vivo bound TG2-specific IgA by immunofluorescent studies as outlined below. Snap-frozen brain tissue (stored at −70°) from a 63-year-old man with a 3-year history of progressive gluten ataxia (not on gluten-free diet) was also examined using the same methodology. The patient had positive IgG antigliadin antibodies and the human leukocyte antigen (HLA) DQ2 and DQ8. Duodenal biopsy showed no evidence of an enteropathy. He died secondary to aspiration pneumonia. As control we used frozen cerebellar tissue from a 2-year-old child who died of pneumonia and had no neurologic or gastrointestinal disease. Double-color immunofluorescent studies were carried out on 5-μm-thick unfixed frozen sections after extensive washings in phosphate-buffered saline to remove blood-related antibodies from the tissues. Human IgA, IgG, and IgM in the tissue were labeled in separate sections in green by fluorescein isothiocyanate–labeled polyclonal rabbit antibodies specific for the respective heavy chains (Dako AS, Glostrup, Denmark), and TG2 was labeled in red by monoclonal antibodies CUB7402 (NeoMarkers, Fremont, CA) followed by rhodamine-conjugated rabbit antibodies against mouse immunglobulins (Dako). The sections were examined for overlap of the green and red labels appearing in yellow using an Olympus BX60 microscope with appropriate filters. Blood vessels in brain were visualized by rabbit antibodies against the endothelial marker von Willebrand factor (Dako), followed by rhodamine-conjugated antirabbit antibodies. The staining protocol was previously extensively evaluated,9 and no cross-reactions between secondary antibodies occurred when used in appropriate order. Duodenal biopsies from all nine patients with gluten ataxia were examined for the presence of IgA deposition associated with extracellular TG2. The clinical characteristics (table) of these patients were in keeping with those of a cohort of 100 patients with gluten ataxia characterized by our group.10 All patients had cerebellar ataxia, circulating antigliadin antibodies, and no alternative etiology for the ataxia. The serum antibody profile, the HLA typing and the results of the duodenal biopsies are summarized in the table. In four of these patients, there was evidence of an enteropathy on routine histologic examination (villous atrophy, increased intraepithelial lymphocytes, and crypt hyperplasia). In the remaining five, the biopsies were histologically normal. In situ IgA deposits on TG2 were present in all nine biopsies examined. Identical deposits were found in all 10 patients with celiac disease and no neurologic symptoms. An example from one of the patients with gluten ataxia is shown in figure 1. The seven control patients had alternative causes for their ataxia, and all but one also had circulating antigliadin antibodies. The causes of the ataxia were as follows: Two patients had autosomal dominant spinocerebellar ataxia type 6 (SCA6), two had cerebellar variant of multiple-system atrophy (one clinically probable, the other pathologically confirmed at post mortem), one had hereditary spastic paraparesis with mild ataxia, one had multiple sclerosis with ataxia, and one had ataxia related to excess alcohol intake. The patient with ataxia due to excessive alcohol intake was the only one from the control group without circulating antigliadin antibodies. His gastroscopy and duodenal biopsy were performed as part of investigation of anemia. None of the 7 control group ataxia patients and none of the 10 healthy control group biopsies showed evidence of enteropathy or IgA deposits on the small bowel biopsy tissue. The serum antibody profile, the HLA typing, and the results of the duodenal biopsies for the ataxia groups are summarized in the table. Figure 1. An example of small intestinal findings in gluten ataxia with architecturally normal villi (A through E) and in ataxia of other origin (F, G). (A) Subepithelial IgA deposition (green, arrow). (B) Normal tissue localization of type 2 tissue transglutaminase (TG2; red). Merging of green and red labels into yellow indicates colocalization of deposited IgA with TG2 in the villi (C), around crypts (E), and on endomysial fibers of the muscularis mucosae layer (D). (F, G) There is no IgA deposition on TG2, which appears in red. Plasma cells containing IgA (asterisks) do not merge into yellow. Bars = 50 μm. Examination of the brain of a patient with gluten ataxia at post mortem revealed patchy loss of Purkinje cells throughout the cerebellar cortex. The cerebellar white matter showed an astrocytic gliosis, vacuolation of the neuropil, and a diffuse infiltrate mainly of T lymphocytes. Marked perivascular cuffing with inflammatory cells, mainly T lymphocytes with smaller numbers of B lymphocytes and macrophages, was present within the cerebellar white matter and the posterior columns of the spinal cord. The peripheral nervous system showed sparse lymphocytic infiltrate. Brain sections, which included medium-sized blood vessels on the surface of the cerebellum and near the pons, showed a clear endomysium-type IgA deposition within the muscular layer of those vessels (figure 2). The appearance of these in vivo deposits was very similar to that seen when incubating normal human umbilical cord vessels in vitro with celiac serum samples, the established methodology to detect endomysial autoantibodies in the laboratory. In addition, IgA was also found within the brain tissue itself, both within the cerebellum and equally well also in the pons and medulla. Much less IgA was seen in the parietal lobe, and no clear deposition was seen in the basal ganglia. Staining for IgM and IgG showed no such deposits. The IgA in the brain was in many cases granular and seemed to follow the very small blood vessels outlined by double staining for endothelial marker (figure 2C, F, I). On additional staining with TG2, a clear colocalization was found (figure 2E, G, H). Although not all areas of TG2 staining demonstrated IgA deposition, all IgA colocalized with TG2. There was no deposited IgA in the normal brain. Figure 2. Unfixed frozen brain sections of a patient with gluten ataxia (A through K) and of a neurologically normal control (L) stained for in IgA (green), type 2 tissue transglutaminase (TG2; red in E, G, H, L), or endothelial marker von Willebrand factor (vW; red in F, I). Both patients died of pneumonia. (A) Medium-sized brain artery near the pons showing in vivo bound IgA in its endomysium. Small vein (B) and very small vessels (C through I) in the cerebellum with in vivo bound IgA within their wall. 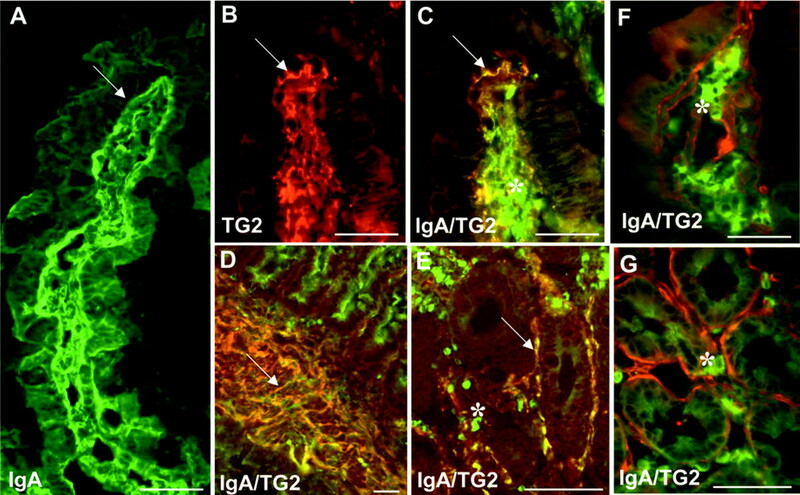 The deposited IgA is related to vessels (I) and colocalizes with TG2 (G, H; merging of the green and red labels into yellow). (J, K) Same vessels shown by hematoxylin and eosin staining. (L) There is no deposited IgA in the normal brain. Blood vessels of similar size as in B (asterisk) and C through I (arrows) express TG2 similarly as in gluten ataxia. Bars = 20 μm. In this study, we have also examined small bowel biopsies from patients with alternative etiology for their ataxias (including genetically characterized ataxias) who were positive for antigliadin antibodies (which is why they underwent small bowel biopsy). The mean antigliadin IgG antibody titer in the control group was 9.8 as compared with 16.6 in the gluten ataxia group (cut-off for positive result was 9 U/mL). As the numbers are small, it is difficult to derive any firm conclusions from this observation, but it is clear that the titer of antigliadin antibodies in the ataxia due to other etiology group is less (being very close to the cut-off for positivity) when compared with the gluten ataxia group. There is, however, no correlation between the level of antigliadin antibodies and the severity of ataxia in patients with gluten ataxia or with the severity of enteropathy in patients with celiac disease. None of the seven patients in the control group had evidence of enteropathy or evidence of in vivo targeting of TG2 as seen in all of the patients with gluten ataxia. There were significant differences in the HLA typing between the gluten ataxia and the control groups. As previously described, the majority of patients with celiac disease or gluten ataxia have the HLA DQ2, with the remaining patients having the HLA DQ8 (as is the case in the gluten ataxia group here). We have previously suggested, however, that patients with gluten ataxia who are not DQ2 or DQ8 (comprising only 20% of all patients with gluten ataxia) have an additional HLA susceptibility type, which is DQ1. The finding of IgA deposits against TG2 even in the patient with gluten ataxia and HLA DQ1 is in support of our contention that DQ1 may indeed be an additional HLA susceptibility marker for gluten ataxia. If we are to accept that in vivo targeting of TG2 in the gut may prove to be the gold standard for the diagnosis of the whole spectrum of gluten sensitivity, then antigliadin antibodies may lack specificity for gluten sensitivity in patients with an alternative cause for ataxia, but they appear to have 100% sensitivity for gluten ataxia (defined as sporadic idiopathic ataxia in the absence of an alternative etiology for the ataxia). Further work is needed to investigate whether some patients with sporadic idiopathic ataxia negative for serum antigliadin, endomysium, and transglutaminase antibodies have evidence of autoantibody targeting of TG2 in the gut and are indeed gluten sensitive. The different types of transglutaminases may also hold the key to the diverse manifestations seen within the spectrum of gluten sensitivity. A recent study reported that patients with dermatitis herpetiformis have antibodies with low affinity for tissue transglutaminase (TG2) but very high affinity for epidermal transglutaminase (TG3).16 This results in an immune response and clinical manifestations in the skin, the main site of epidermal transglutaminase production. An analogous situation we postulate exists in the case of gluten ataxia, where an immune response directed toward neural transglutaminases may result in clinical manifestations primarily in the brain or the peripheral nervous system with variable, maybe only minimal degree of gut involvement, in the form of autoantibody deposition to TG2. Future identification of a specific brain transglutaminase responsible for the neurologic manifestations may allow the development of more accurate means of diagnosing gluten ataxia. In the meantime, however, demonstration of in vivo targeting of TG2 by tissue transglutaminase in the jejunal tissue of patients with gluten ataxia but not in patients with other causes of ataxia may provide an additional useful marker for the diagnosis of gluten ataxia. It can also be a useful distinguishing feature between gluten ataxia and other causes of ataxia with coincidental positivity for antigliadin antibodies. Received June 7, 2005. Accepted in final form October 19, 2005. Hadjivassiliou M, Boscolo S, Davies-Jones GAB, et al. The humoral response in the pathogenesis of gluten ataxia. Neurology 2002;58:1221–1226. Hadjivassiliou M, Williamson CA, Woodroofe NM. The humoral response in the pathogenesis of gluten ataxia: reply from authors. Neurology 2003;60:1397–1399. Hadjivassiliou M, Grünewald RA, Chattopadhyay AK, et al. Clinical, radiological, neurophysiological and neuropathological characteristics of gluten ataxia. Lancet 1998;352:1582–1585. Bürk K, Melms A, Schulz JB, Dichgans J. Effectiveness of intravenous immunoglobulin therapy in cerebellar ataxia associated with gluten sensitivity. Ann Neurol 2001;50:827–828. Sander HW, Magda P, Chin RL, et al. Cerebellar ataxia and celiac disease. Lancet 2003;362:1548. Hadjivassiliou M, Davies-Jones GAB, Sanders DS, Grünewald RAG. Dietary treatment of gluten ataxia. J Neurol Neurosurg Psychiatry 2003;74:1221–1224. Hadjivassiliou M, Grünewald RA, Sharrack B, et al. Gluten ataxia in perspective: epidemiology, genetic susceptibility and clinical characteristics. Brain 2003;126:685–691. Dieterich W, Ehnis T, Bauer M, et al. Identification of tissue transglutaminase as the autoantigen of celiac disease. Nat Med 1997;7:797–801. Korponay-Szabo IR, Halttunen T, Szalai Z, et al. In vivo targeting of intestinal and extraintestinal transglutaminase 2 by coeliac autoantibodies. Gut 2004; 53: 641–648. Hadjivassiliou M, Williamson CA, Woodroofe N. The immunology of gluten sensitivity: beyond the gut. Trends Immunol 2004;25:278–282. Freitag T, Schulze-Koops H, Niedobitek G, Melino G, Schuppan D. The role of the immune response against tissue transglutaminase in the pathogenesis of coeliac disease. Autoimmun Rev 2004;3:13–20. Cooper AJL, Jeiter TM, Gentile V, Blass JP. Cross linking of polyglutamine domains catalyzed by tissue transglutaminase is greatly favored with pathological-length repeats: does transglutaminase activity play a role in (CAG)n/Qn-expansion diseases? Neurochem Int 2002;40:53–67. Schrodl D, Kahlenberg F, Peter-Zimmer K, Hermann W, Kuhn HJ, Mothes T. Intrathecal synthesis of autoantibodies against tissue transglutaminase. J Autoimmun 2004;22:335–340. Bushara KO, Goebel SU, Shill H, Godfarb LG, Hallett M. Gluten sensitivity in sporadic and hereditary cerebellar ataxia. Ann Neurol 2001; 49: 540–543. Bushara K, Nance M, Gomez C. Antigliadin antibodies in Huntington’s disease. Neurology 2004;62:132–133. Sardy M, Karpati S, Merkl B, Paulsson M, Smyth N. Epidermal transglutaminase (Tgase 3) is the autoantigen of dermatitis herpetiformis. J Exp Med 2002;195:747–757.